Toronto, Canada—July 10, 2017—Fiix announced today that the company has added a new layer of business intelligence to its platform with the release of a best-in-class, completely customizable dashboard, which helps customers easily visualize maintenance data. Fiix is the leading provider of cloud-based maintenance and asset management software. The company’s multi-tenant, cloud-based platform enables businesses to organize their maintenance departments and turn data into actionable insights, ultimately helping maintenance teams reduce downtime, and improve productivity and business performance. The new Fiix dashboard brings data visualization to the forefront, helping businesses easily access functional data by displaying key metrics in simple widgets that can be filtered by time, asset, site, user and more, giving organizations a deep understanding of their maintenance operations. “Most maintenance teams don’t have an in-house data scientist. So they’re collecting a lot of data, but don’t have the resources to really leverage it. This new dashboard immediately identifies the most important KPIs right out of the box and answers a lot of questions about what maintenance metrics you should be tracking for better performance. And with drag and drop widgets, it’s easily scalable for enterprise organizations with more sophisticated needs,” says Andy Yadegar, Head of Product Management at Fiix. 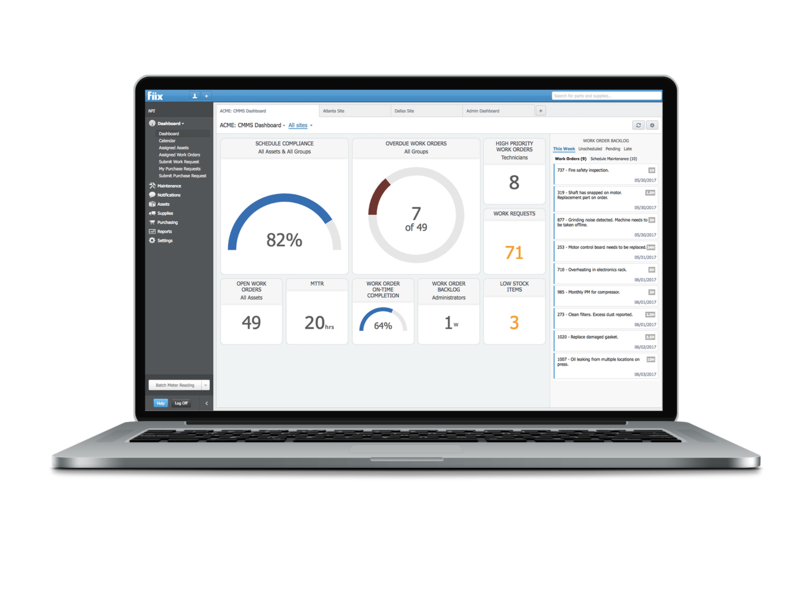 “Business intelligence does not have to be complex and we’ve proven that by marrying intelligence and usability in the new Fiix dashboard. Our roadmap is focused on layering on even more intuitive BI tools like industry benchmarking and trend analysis, which are unique to Fiix’s multi-tenant cloud platform. This takes the capabilities of our software miles beyond organizing and scheduling work orders, and we’re excited to enable our enterprise customers to not only find these insights but act on them and ultimately improve their business,” says Yadegar. Fiix has long been committed to developing a modern computerized maintenance management system (CMMS) in a space often dominated by inflexible legacy solutions. In a move to define modernity in a maintenance management context, the company is developing and extending its platform with a focus on ease of use, business intelligence, connectivity, and mobility. Investing in these pillars is helping Fiix create a truly intuitive CMMS that can be used by everyone in the maintenance chain—from technicians and managers to business leaders. 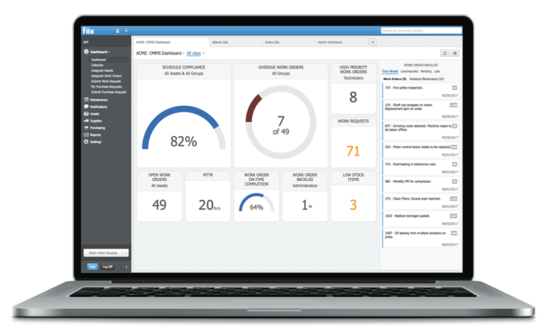 The new dashboard is the first of several product releases expected this year that are purpose-built for enterprise customers. Fiix will continue serving the enterprise market by extending its API to connect to more software solutions than ever before, mobilizing the maintenance workforce with a completely revamped mobile solution, and continuing to make the easiest-to-use CMMS on the market. To learn more about the new Fiix dashboard, please visit www.fiixsoftware.com/blog/the-new-fiix-dashboard. Fiix creates easy-to-use, intelligent maintenance management software that empowers businesses to organize their maintenance departments and turn data into actionable insights. Its innovative multi-tenant cloud-based CMMS mobilizes the maintenance workforce with an unparalleled mobile experience and seamlessly interfaces with enterprise software to connect your entire organization— revolutionizing how thousands of companies worldwide schedule, organize, and track maintenance. Fiix® is a registered trademark of Maintenance Assistant Inc.